This guide will explain how to establish a connection with a Google Analytics application on your Squiz Matrix system, and integrate this connection with you Edit+ for Squiz Matrix installation. This guide assumes you already have a Google Analytics account set up with some analytics data populated from your site. In order to integrate your system with Google Analytics, you will need to configure a project in your Google APIs Developer Console to allow your system to access the API credentials. For more information on creating and managing projects on your developer console, view the Google APIs Console Help documentation. The Analytics API has been enabled on the APIs screen. Create a Google Analytics Connector asset. On the Details screen, enter the ID and Secret provided to you by Google (your project on the Google APIs Console) in the Client ID and Client Secret fields. Click Commit. Preview the Google Analytics Connector asset in the front end; you will be redirected to Google for authentication. Upon successful authentication, the details of the access token will be displayed on the Details screen of the Google Analytics Connector asset. In the Views section of the Details screen, a list of available views will be displayed. Select the view you want to create from this list and enter a name for the view in the View Asset Name field. Click Commit. A Google Analytics View asset will be created in your system as a child asset of the Google Analytics Connector. 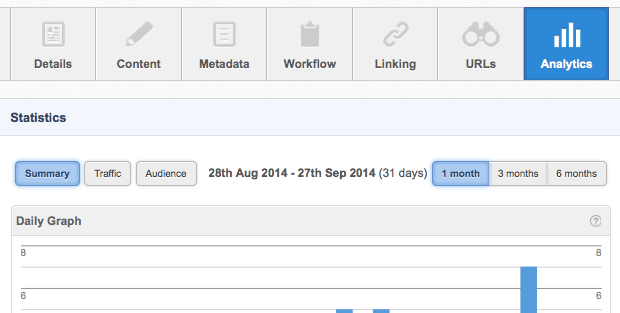 You can use this asset to display reports and summaries of the data of your site. Once you have established a connection with your Google Analytics application and created a Google Analytics View asset, you are able to integrate this connection with your Edit+ for Squiz Matrix installation to provide analytics data within Edit+. When your Google Analytics connection has been correctly integrated with Edit+ for Squiz Matrix, a new Analytics screen will be made available for your assets, displaying the analytics data of your assets. For more information on the data available on this screen, refer to the Analytics Screen chapter in the Edit+ for Squiz Matrix manual.